How Tia Lola Saved the Summer by Julia Alvarez. A Tia Lola Story. Review: Summer breaks are for relaxing and having fun, right? Miguel thinks the same thing until he learns that Tia Lola's lawyer, Mr. Espada, and his three daughters are coming to visit. How will Miguel survive? He's shorter and not too fond of girls. How Tia Lola Saved the Summer by Julia Alvarez is a great book. This book is one book in the Tia Lola series. You can read it without reading the rest of the series. Can Tia Lola, his wonderful aunt, save Miguel's summer break? Miguel is a young boy in elementary school. School has just let out for the year and he's looking forward to a nice, long, relaxing summer. He's disappointed to find out that three girls are coming to stay with his family. After his parents went through a divorce, Miguel is suffering. Three girls certainly can't do much good! It's up to Tia Lola to save the summer. As it turns out, she does, creating a summer camp. Tia Lola gives everybody swords, and they learn to remind themselves that they can overcome everything by looking at their swords. The girls love it and Miguel finally gets his wish: to have a real father again. Victor, the widowed father of the girls, Victoria, Esperanza, and Cari, befriends Miguel's mother. He decides to come and live with them in Vermont. Maybe Miguel will have a father after all! Join, Miguel, Vicky, Essie, Cari, and their dog, Valentino, in Tia Lola's summer camp, where Miguel finally learns to enjoy his summer. The author, Julia Alvarez, does an excellent job of writing How Tia Lola Saved the Summer. She writes with solid understanding of the predicament she's writing about. She truly gets into the story and makes the reader feel the tough situations that everybody is struggling through. Her exceptional characters made the story really interesting to read. Tia Lola has the true qualities of a perfect aunt. She's caring and solves everybody's problems. Each chapter is about somebody's problem that Tia Lola solves in an interesting way, reflecting the author's ability for writing. It's an excellent book. All of the events are based off of what you might see every day over summer break, including catching tadpoles in the pond. Join the girls for a packed summer filled with fun, just ready to burst. I think the book is wonderful, just waiting for a young reader to open it and travel to a different world. I rate How Tia Lola Saved the Summer four out of five stars. 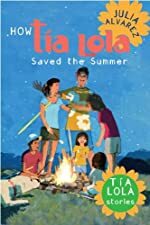 We would like to thank Random House for providing a copy of How Tia Lola Saved the Summer for this review. Have you read How Tia Lola Saved the Summer? How would you rate it?